We manufacture ergonomic tools for your workplace! Application: The parts were being placed in a dunnage rack with very little space for set down. The tool required precise set down with high speed. 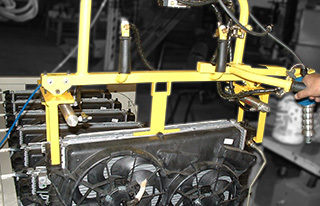 Problem: Customer was handling radiators coming off an assembly line at a high rate of speed. The radiators weighed roughly 40 pounds of which the operators had to pick up every 15 second and locate in a shipping dunnage. Solution: We integrated a Gorbel Zero-Gravity PLC controlled hoist with a custom pneumatic lift device. There were several parts, so a common location point was found on all of the parts. This allowed the operators to come down quickly onto the part and grip without having to focus hard on locating the end effector. The Gorbel Zero Gravity hoist (Gorbel G-Force intelligent assisted lifting device [IAD]) had a speed of 275 fpm and had intelligent features allowing for speed reductions points and upper and lower virtual limits. When loading the dunnage, the radiator lift hoist was set to automatically slow down 1 inch before the bottom of the dunnage. This allowed for the operators to move at a high rate of speed without fear of damaging the part. Result: Custom pneumatic grip tool to lift up automotive radiators with high speed Gorbel G-Force PLC controlled hoist. The lifting device is powered by pneumatic cylinders with dual interlocking release to prevent inadvertent part release.